I have to say…I’ve been really enjoying this little loomy get-together and project! 😀 It’s just a straight forward little dealy-bob, but it’s very satisfying the way all those little pieces and steps just fall into place, isn’t it? I hope you’re all enjoying it as much as I have been. Remember those “options” I spoke about, way back in Part I? Well, let me tell you that I’ve explored those options to the fullest in my most recent Winter Whimsy excursion, lol. Remember this little baby? This is something that has been lingering on my blue loom…I’m ashamed to admit…but, it’s been there since January 2008! This is 2 years, folks. 😛 Well…I decided to rescue this very nice project, but neglected just the same, and put it to another purpose. You guessed it! I made this baby into a Whimsy! Because I didn’t have a double layered panel, I didn’t have that “middle” allowance to thread my I-cord through invisibly, so I created 2 little casing (or tube) panels, in which the I-cord is threaded through, and can be pulled freely from one side to the other. In case you want to know exactly how I did this, I pulled 5 stitches up through my loom and onto the pegs, from about 5 stitches in from the outside edges at my middle-2.5″ measurements (*see Part II), so that I would be knitting toward the direction of the outside edge. 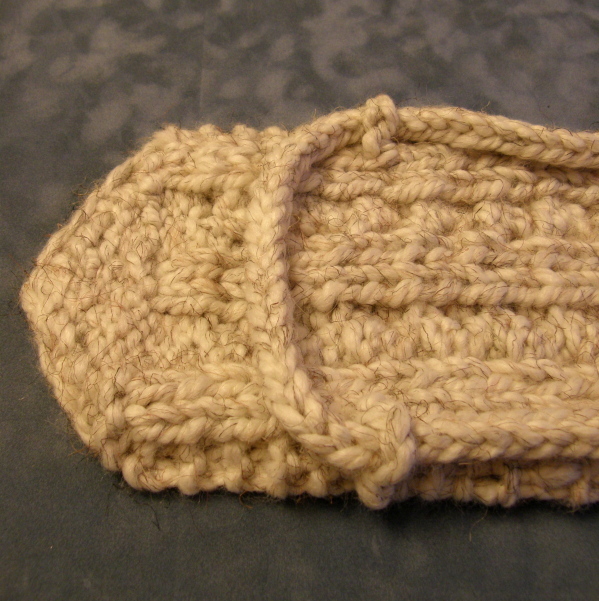 Then I panel knit 6 rows. I pulled up the stitches onto the loom that were directly in line from the original ones pulled up, at the 2nd stitch from the end (just like you would for the brim of a hat), and then I used a Basic BO on all pegs, lifting 2 loops over 1. This is an excellent way to create a casing for any of your projects. **Please Note! The number of pegs used and rows knitted will need to be adjusted for different gauges of yarn!! As you’ve probably noticed in the picture above, you’ll need to create a couple little anchor tubings for your I-cord to travel through at the top of the Whimsy, near the flap. This step really helps stabilize your Whimsy when it’s being used as a Pocket Purse. You’ll want to place the anchors about 1.5-2″ below the base of the flap, so that when the 2 panels are placed together, with the bottom (furthest away from flap) edges even, they will sit unseen, just under and inside the top edge of the Whimsy. In order to create this anchor tubing, you may use just a simple crocheted chain, or a whipstitch tubing, as described in Part II… just make sure that your I-cord can still be pulled through all of the casings freely. Assemble your panels, as hinted at above, with the bottom edges, which are the edges furthest away from the flap, aligned. 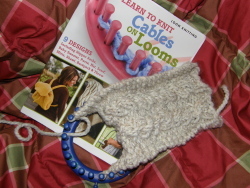 You will be stitching them together along the 2 long edges, leaving the ends open, and the I-cord free. You may choose a variety of ways to do this: you may single crochet them together (as in the original sample pictures), or whipstitch them together, or use a decorative blanket stitch (as I have used in my newest sample in the completed project pics below). The neat thing about this process of blanket stitching for me this time, is that I’m intending on giving this Whimsy to my daughter on her 18th birthday coming up in April. It will go perfect with these! This yellow embroidery thread I’m using was originally used to embroider her nursery items when I was still expecting her arrival! How cool is that? 😀 Yes…I do tend to hang onto things for a long time. Have I mentioned that I have a little pack-rat tendencies, lol? But, I’m ever so glad in this particular case! Now for the final touches… adding the buttons! You’ll need to close up your Whimsy, as you would for both the bag, and the cowl, and decide on the best placement for your buttons. Mark those places while your flap is held in place, so that it doesn’t get lost once you’ve repositioned for sewing. Stitch your buttons on securely, making sure to only be sewing through the top panel. You’re all done! 😀 It’s time to go try it on in front of the mirror, and play with all the different ways this project can be used…To use as a Bag, you just slide the strap out of it’s hide-y-hole and button the pockets closed. 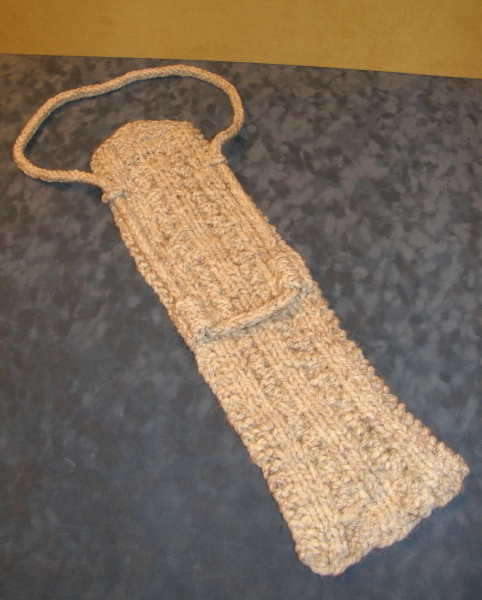 To convert back into a snuggy Muff or Cowl, just pull the strap back inside by reaching up through the bottom edge and pulling the strap back into hiding…neat! Now, it’s only up to your Whimsy how you’ll Wear it! I will catch up one day. YAY! I’m so excited. I think i’ll have some questions but wanna read through it again. Thanks again Bethany! 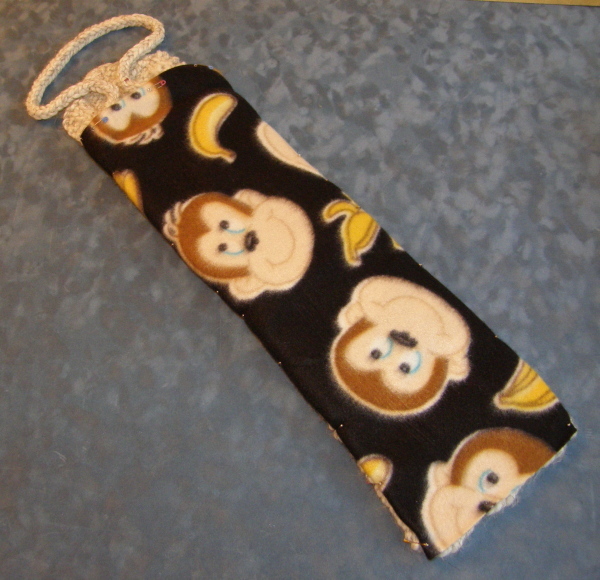 Cute monkey print! Guess I’d better get back to part 2. All done! Just need to get some buttons. I thought the ones I had would work, but not really. I am going to make these for Christmas presents next year for sure!!! Thanks for the great project. Whoo hoo! Can’t wait to finish up! Thanx Bathany! I love the “super save” on the cabled piece. It turned out beautifully, too! Oops! I forgot to check the “Notify” boxes. Thanks, Brenda! 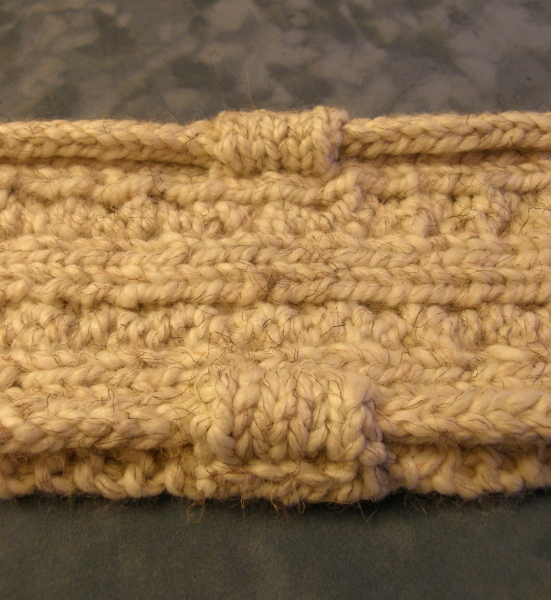 It was very satisfying to finish that cabled piece…even if it was a change from it’s orginal purpose, lol. 😉 But that’s one more thing I can mark off my to-do list! Still playing catch-up! Your Whimsy is very cute! I’m glad I can use some fabric in this project. Yarn and fabric, my two addictions! Here’s a pic of my whimsey minus the buttons. Very nice, I love the colors you used. 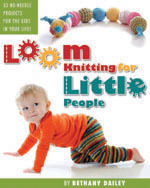 Which loom did you use for the project? Kelly, I love it! It’s so soft and cozy looking! 😀 Excellently done!!! So after laying my two pieces together, I decided that I like just the single double knit as a whimsy. 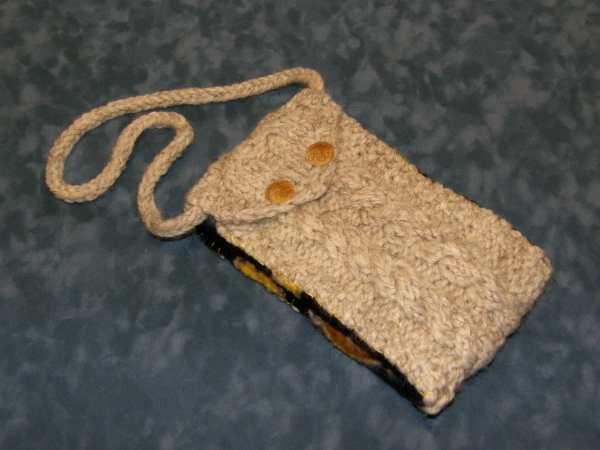 I didn’t plan on turning it into a purse so would the project still be a whimsy with just one panel and no purse? 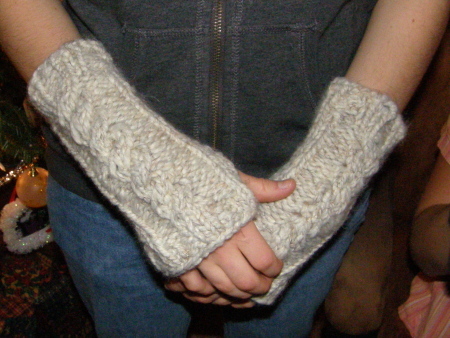 Jessica, in answer to your question…I think it would be fine, if you don’t intend on using it as either a purse, or hand muff (which is actually my personal favorite, as my hands are always freezing, lol! ), to not go the extra steps, and still call it a whimsy. 😉 Is this the way you want to go?? Bethany – When you first announced the project, I immediately fell in love with the cowl. 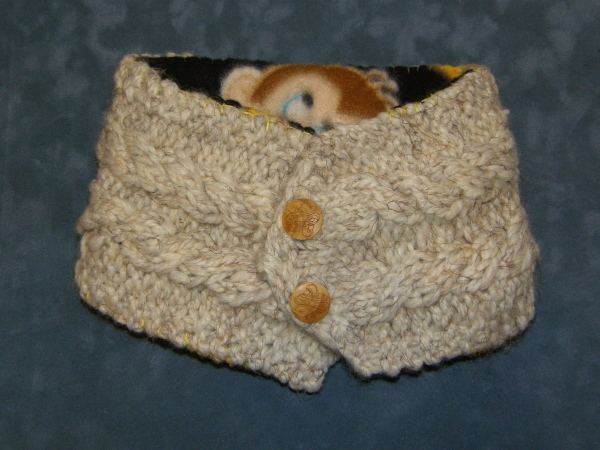 I love cowls and that’s what I intended to make. I held the second part with the first part and it just felt a bit too snug for me, but the one panel was perfect. I’m going to make more and give them as mothers day presents to my mom and mother in law and those I will make as you’ve instructed. 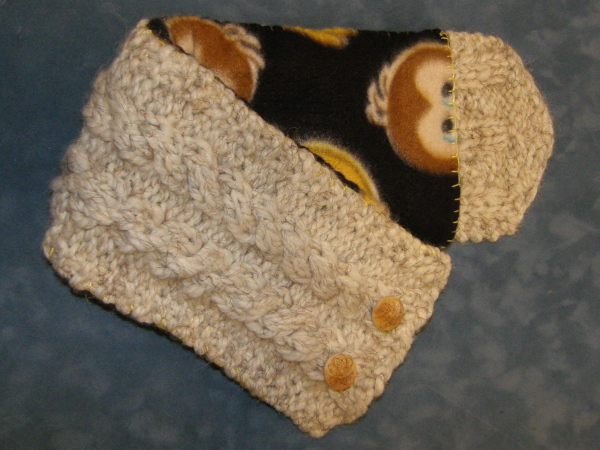 I did not make mine into the purse…I knew I would not use it that way, but made it for the cowl and the muff. It is SO soft. Will post pictures in a bit. Mine is in cyberspace winging its way to you as I type!! I found the buttons in a container of old buttons my brother had. Been dying to use those metal buttons with the ivy on them. This was the perfect project. http://pamscraftsprojects.blogspot.com/, and will email one to you. Loved this project Bethany, will be making some more of these for Christmas presents for my daughters and granddaughters. Pam, I just LOVE your Whimsies! 😀 They look so comfy and cozy…your family is going to be very blessed to receive these for Christmas gifts this year. 🙂 Thanks so much for sharing! Darn…mine is not done. I have the first part and almost done on the second…I have about 2-3 inches to go and then the flap. I have been battling fixing our dryer and not had time to finish. I love it so far though as I used a regular acrylic with Patons Carmen…I LOVE loVE this yarn…soo soft. I may just use the double thickness like someone else.